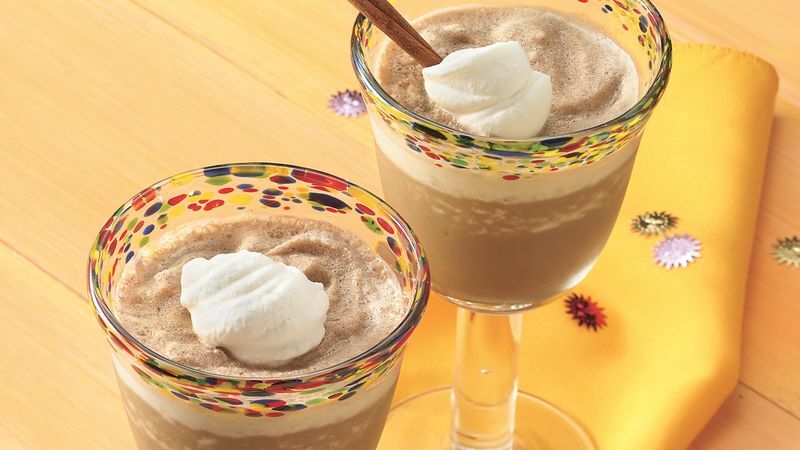 In blender, place all ingredients except ice, whipped cream and cinnamon sticks. Cover; blend on high speed until mixed. Add ice; cover and blend until slushy. Top individual servings with dollop of whipped cream and cinnamon stick. Most home blenders don't handle large ice cubes well. To crush ice cubes, place them in a heavy-duty plastic food-storage bag and seal the bag. Place the bag on a cutting board; cover with a kitchen towel. Crush the cubes with a hammer or rolling pin.